ITR: Kiski Area travels to Johnstown, Westmont heads back west to Greensburg. DELMONT, Pa.— Last week the Kiski Area Cavaliers hosted the Hilltoppers from Westmont. Both teams came out even after the first. Westmont Hilltop scored first, Lane McQuillan (0:21), followed by a Cavaliers goal by Ryan Welsh (5:20). The teams traded another set of goals from Hunter Partsch, Westmont (6:54), and Colin Haugh, Kiski (10:04). While the Hilltoppers outshot the Cavaliers 12 to 4. Kiski Area took advantage of their chances by converting two of the four shots into goals. Ryan Welsh scored twice (7:47 and 14:12) to complete the hat-trick and gave the Cavaliers a 4-2 lead headed into the third. Westmont Hilltop came into the third with a strong second wind. Scoring six goals in the first 10 minutes of the final period. Jack Spencer received two goals (1:17 and 6:54). Hunter Partsch finished a four goal night, 1 in the first and 3 in the third. Lukas Shiley finished the scoring at 9:27 to make the final 8-4. Westmont Hilltop’s powerplay went 1 for 4 and Goaltender Darren Replogle (3-7, SV%: 0.813) stopped 11 of 15 shots on goal. Kiski Area’s powerplay went 0 for 2 and Goaltender Eric Petika (0-14, SV%: 0.835) stopped 34 of 42 shots on goal. Kiski Area travels to the Cambria County War Memorial, in Johnstown Pa., to face Bishop McCort on February 12th. The Bishop McCort Crushers are riding a 8 game win streak and currently first in the East with 26 points. Two week will past since Bishop McCort last played, a 7-3 win against Westmonth Hilltop on January 29th. Kiski Area’s only win on the season was a forfeit by Bishop McCort on October 18th. Colin Haugh leads the Cavaliers as a skater with 13 points (7G/6A) and Eric Petika has a SV% of 0.835. Raman Yerameichyk leads the Crushers with 47 points (25G/22A) and Cole Bradley has a SV% of 0.880. 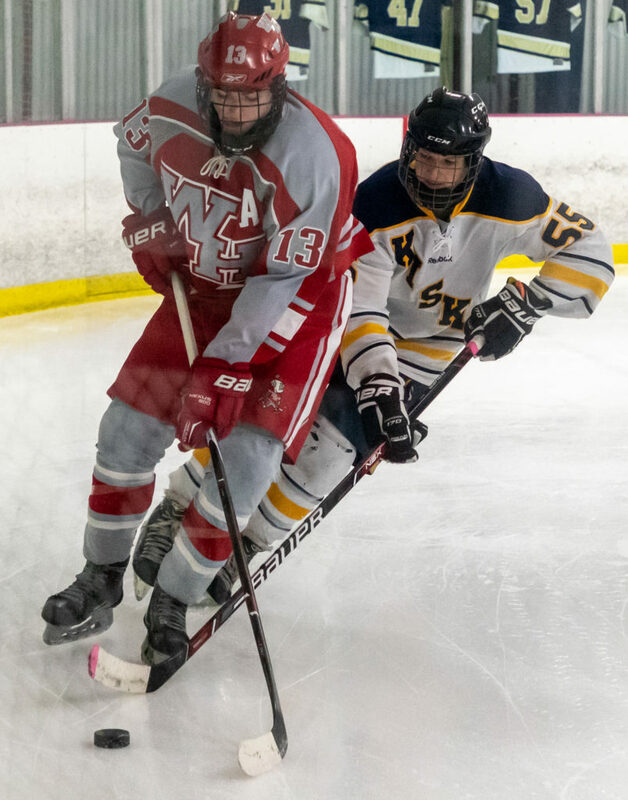 Westmont Hilltop heads back west to Kirk Nevin Area, Greensburg Pa., to face the Greensburg Salem Golden Lions on February 14th. Westmont Hilltop sits 8 points ahead of Greensburg Salem but both teams are headed to the playoffs. The Golden Lions are coming off a 9-2 lost against Indiana last Thursday, February 7th. Hunter Partsch leads the Hilltoppers as a skater with 23 points (16G/7A) and Alexander Schelkanov has a SV% of 0.900. Brendon Linderman leads the Golden Lions as a skater with 30 points (16G/14A) and Andrew Stead has a SV% of 0.776.